A coat is one of the few items that you, your mum, and the general public all agree it’s worth spending good money on. The general rule of thumb is that you should buy one coat per year, which will see you through autumn and winter. (Note we said coat, not jacket, you can buy as many of those as you like.) The logic goes: pick one coat and spend a bit more to avoid wearing something that looks like outerwear but performs like paper when pitted against the elements. It’s not just quality you need to consider, though – longevity is important too. While a bold yellow puffa might give street style photographers RSI at men’s fashion week, it will date, fast. If you don’t want to be limited to a couple of seasons’ worth of wear, you need to be a grown-up and swerve the shiny, trend-led designs for something a bit more classic. Not sure which styles will age like fine wine and which will age like a bad curry? That’s where we come in. We’ve rounded up seven timeless coats that no man should be without. Wrap up. The peacoat is one of those jackets that quietly makes men more stylish without shouting too loud about it. Worn successfully by everyone from Prince George to Prince (yes, that one), it’s a style that works on everyone, which is why it’s gone viral and stayed viral since it first appeared way back in the 1800s. What’s the secret to its enduring success? Like most menswear classics, it’s versatile. “A peacoat works worn over a suit for that Mad Men/Goodfellas vibe and looks especially great accessorised with a cashmere scarf,” says celebrity stylist Alex Longmore. It’s not just the nine-to-five you roll out the peacoat for, though – it’s not averse to letting loose on the weekend. “It’s very versatile, so can be worn with jeans and a polo neck to smarten up off-duty looks,” says Longmore. You could even use it to top some tailored joggers and a sweater for an easy and relaxed outfit you could put together on the worst hangover. Give peas a chance. The waxed jacket has become sartorial shorthand for best of British style, and such is its appeal it can be happily worn by country toffs, city dwellers, your little sister and your grandad – which in the age of Brexit makes it one of the few things that the country can get united behind. The style owes its success to being an inherently practical piece of kit. It’s not waxed for the fun of it – the technical coating ensures raindrops roll right off. “A wax jacket is versatile and tough enough to brave the great outdoors with knitwear yet equally suited to city wear – perfect for throwing over a suit when commuting to work,” says Ian Bergin, director of menswear and accessories for Barbour. The unassuming style works with everything from wool trousers to denim, knitwear to casual shirts, so reach for one whether you’re going for the landed gentry look or a laid-back streetwear vibe. It’s seasonless too, Bergin adds. “Ideal for year-round use, a wax jacket can be combined with an optional quilted liner or knit when extra insulation is needed. It’s an item that travels through life and ages with you.” Heritage that gets more heritage-y with age. We approve. Odds are your first experience with a rain mac was at school, when you were blissfully unaware of how lurid, shiny and primary in colour your outerwear was. Now that your mum’s not in charge of your wardrobe (we hope) you can slip into something a little less migraine inducing. Unlike the rain macs from your formative years, grown-up versions have got seriously impressive style credentials in their DNA. The Guardian’s menswear editor Helen Seamons explains the style’s iconic appeal: “The rain mac is a fully paid up wardrobe icon, with hours of silver screen time providing some killer mood board moments for macs. You can easily channel legendary 1940s American actor Humphrey Bogart in Casablanca and belt up with aplomb,” she says. Rain coats in staple shades like navy and black are the most versatile, but classic beige or modern khaki green options will bring a welcome point of difference to your wardrobe. Whichever colour you opt for, throw it on over everything from suiting to denim, but leave Bogie’s trilby on the tarmac. Stating the obvious klaxon: every man who is no longer in his teens needs a camel coat. Why you ask? Well, there’s the fact that it’s both formal enough for the boardroom and has the ability to smarten up even the scruffiest of looks. Then there’s the point about not letting your wardrobe descend into darkness every winter. This ability to inject colour into seasons dominated by black, grey and navy is something that’s not lost on River Island’s Style Studio & VIP relations manager, Giles Farnham. “A camel coat is a timeless classic that will steer you away from the dark side during autumn and winter,” he says. It gets better. The camel coat isn’t fussy about what type of clothing it’s recruited alongside, from button-ups to zip-ups, crew necks to roll necks. “Wear over a suit to keep it formal or with your new winter knitwear and jeans to make it the stand-out piece of a casual look.” A true wardrobe hero and all-round people pleaser. The frequency with which you’ll see men with a duffle coat on their back is roughly inversely proportional to their age. There’s no good reason for this though: can you ever remember looking bad or feeling cold in one of these horn buttoned beauties? Thought not. You don’t have to be four foot nothing to rock the playground classic: there are plenty of duffle coats from menswear designers that offer mature style that doesn’t date as the years pass. Just ask Paddington Bear, he’s been wearing his trusty duffle for a good half-century. Paul Higgins, a stylist who has worked for brands such as Aquascutum and Reiss, explains the coat’s long affair with menswear: “The duffle was originally used in the military and for expeditions but it’s now a menswear staple and one of the only styles to be pretty much unchanged since its creation.” So, how did it go from war kit to street staple? “The duffle was a hit in the 1950s and 1960s, with a surge in usage due to artists and students having access to cheap ex-military coats.” Once its sartorial merits were fully appreciated, there was no looking back. Instant classic. In truth, the duffle is easiest to wear when you’re in off-duty mode, though on occasion it will team well with a suit. If in doubt, it’s the prime winter coat to throw on with your weekend garms. 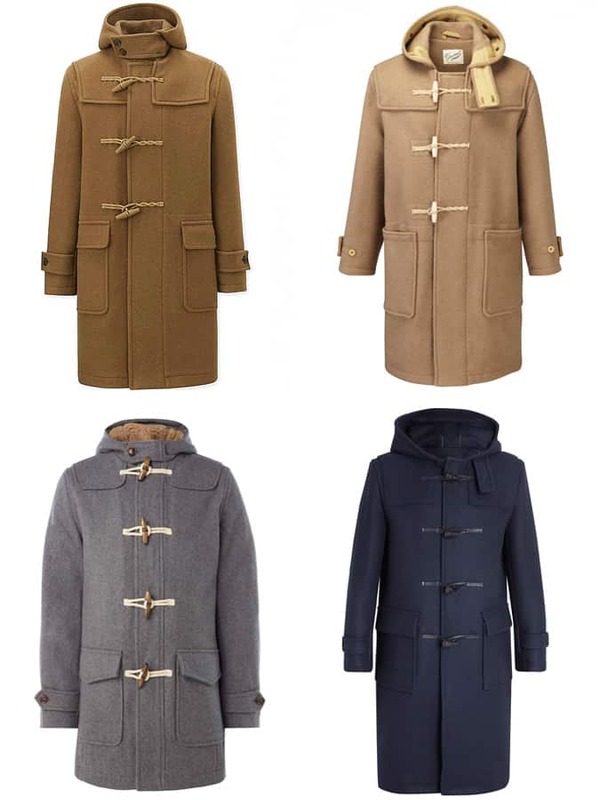 “The duffle coat is a great winter piece which will pair handsomely with a thick woollen roll neck jumper, tweed trousers, heavy boots and check scarf for a clean look,” says Higgins. Winter walks never looked so stylish. Yes, the parka jacket may have retreated a little since its Britpop heyday, but it’s never really gone away and will likely, ahem, ‘Live Forever’. Here’s why: few other pieces of winter outerwear leave you feeling as fully weather-proofed. Whether you go long and fish-tailed or fur-lined and down-filled, its traditional zip and button double closure will keep winter on the outside. So, while initially the mere mention of a parka jacket may induce involuntary renditions of ‘Wonderwall’, as long as you avoid the Madchester mullet hairdo, you’ll be at a comfortable distance from nineties cliche. Our tip? Try wearing one over your suit for a look that takes the staleness out of tailoring. A check or tweed coat might not sound like your type of thing on paper, but take the plunge and you’ll likely be surprised. Although these heritage wool coats might initially bring to mind the smell of mothballs and hard-boiled mints, designers are now producing the timeless style in a variety of contemporary cuts, so you can rock this classic like a modern-day Paul Newman. Whichever take on this heritage classic you go for, you won’t be short of things to wear it with it. Jeans and wool trousers are the obvious choices, as is knitwear, but if you want to riff on menswear’s current love of high-low outfit combinations, get physical. “With sportswear a prominent trend of late, try layering a smarter overcoat over a hoodie for an updated look or pair with a tracksuit pant for a sports luxe edge,” says Street. 8 Men's Jumpers That Will Never Go Out Of Fashion Get knitted out for autumn and beyond How To Make Your Grooming Routine Sustainable Scrub up and keep the planet clean while you're at it The 15 Best French Menswear Brands How many do you own?